For those who are wondering what the hell I’m talking about, MPB Day is a fabric shopping extravaganza in NYC, organized by Peter Lapin of the blog Male Pattern Boldness. Not only is he an amazing talent and all around great guy, his followers are the most fun and creative people one would ever want to meet. I didn’t get to go last year, and decided that come hell or high water I wasn’t going to miss it this time. So I’m getting ready. (For more info about MPB day click here). The garment district in NYC can be overwhelming. There are just too many choices to make in too little time. Some of the bigger stores, like Mood, leave me glazed over and almost paralyzed. The place is usually packed with shoppers. After wandering around like a lost zombie, I usually come away empty handed. This year I hope to have a better “game plan”. For me, that means looking at what’s coming down the runway, and how I might incorporate some of those looks into my wardrobe. From there I’ll try to build a shopping list to keep me focused. So here are some looks that interest me, amidst the sea of streetwear and logo covered menswear that seems to be dominating the fashion world. First up is this toile jacket from Dior Homme. I admire the pattern matching on this garment, along with its simplicity. Recreating this look would be totally doable. I actually have a sort of “tea stained” black toile in my stash. It’s hard to tell how this jacket closes, maybe a zipper?? I’ll put a separating zipper on my shopping list. I can see pairing this with a pair of black / white seersucker Jeds, so I’ll put that on my potential shopping list too. I guess it’s never to late to be thinking Spring. However, I’ll skip Dior’s see thru pants with boxer shorts look! These two looks are from Siki Im, Fall 2018. If you can get past the ridiculous styling, there are some interesting details here. I’m intrigued by the vest shape portion that becomes the flap of the pockets on the longer coat. (I wonder what happens in the back). I’m also drawn to the kimono-ish style of the short jacket. 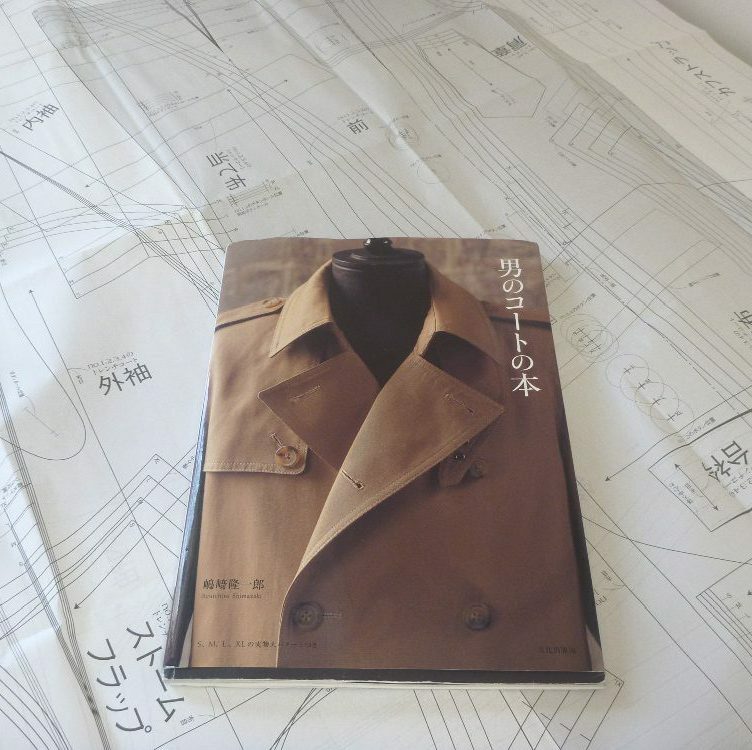 There’s a bookstore in the garment district that sells Japanese pattern books, and I’m pretty sure there’s one on men’s and women’s kimonos. I think it’s time to pay that store a visit. I’m totally crushing on the shape of these cargo pants from Z-Zegna. To me they’re reminiscent of vintage ski pants from the 1940’s. I have some heavy brown wool tweed in my stash that would be perfect. I just need to add buckles and webbing to my MPB day shopping list. Pacific trimming is probably my best bet. The jacket on the left is Billy Reid. The right is Deveaux. The main attraction for both is the fabric. They both appear to be boiled wool. I could easily knockoff the Billy Reid with my “Phoney Missoni” pattern. I’ll add this to my “wish list”, and hope to discover a bargain in one of those crazy, crowded, hit or miss stores. It’s not a big priority since I already have materials for a new winter coat (I’m thinking a vintage vogue Pierre Cardin). It will need buttons, top stitching thread, shoulder pads and maybe some leather scraps. This is a good example of how I need to stay focused. It’s so easy to get carried away looking at beautiful fabrics for future projects, and totally forgetting the little bits that are essential to projects currently in the works. Add trim / button stores to my shopping list. Lastly, I’m drawn to this whole look by British designer Margaret Howell. I have very little experience sewing with knits, but if a nice solid sweater knit showed up, I’d be all about it. Of course I’d have to find a matching solid cotton shirting, since that’s a big part of the attraction. I’ve learned from experience that trying to find a very specific fabric in NYC is like looking for a needle in a haystack. For me, it’s always been a recipe for disaster. Trying to duplicate this look, as much as I like it, is best left forgotten. At least for this trip. Plus, I have at least three projects in the pipeline. Enough to keep my busy well into the Fall. I know what you mean about some fabric shops being overwhelming. I certainly think you’ve got a good plan. Have a great day in the garment quarter! Love the Pierre Cardin pattern – I’m on the look out for winter coat patterns, perhaps I shouldn’t limit myself to the women’s patterns! I’m delighted you’ll be coming on the 11th, Duane. Looking forward to seeing you again! It looks like that toile jacket closes with a concealed button placket. (See bottom edge where a button is showing.) Have a great MPB day! I just got home from a six-week trip so I can’t make it to MPB day this year, sadly. I bought fabric in Dublin, Belfast and London so I’ll just fantasize about those projects while you (plural) are enjoying the garment district. I always felt the same when I went to the fabric district in Los Angeles – overwhelmed! Making a list is a great idea! I’m jealous because I would love to go to MPB day.